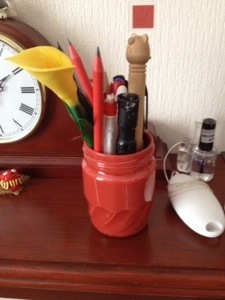 Jars are a fantastic resource they can be used and re-used over and over again. They are one of the easiest to be re-used and most people do it without thinking. There are also ways to make jars a bit more fun, everyone loves a pop of colour in their living spaces and this easy way to decorate a jar can match any decor that you have. When I bought my house it had been abandoned so was full of old furniture and many, many years of rubbish and dust. Some of the leftover stuff that I could never see myself using, including a triple bunk bed and a play kitchen, and they went on Freecycle and quickly found themselves a new home. Others were kept with some sort of thought that they could be used somewhere else, these were mostly things I could break down into basic materials such as doors from old cupboards and an old chipboard wardrobe but among all of this stuff there was a dressing table.